This guide will assist you in finding the perfect handicap bathing aid for your home. 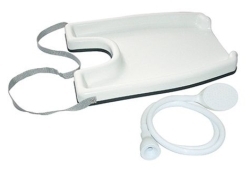 There are several basic styles of handicap bathing aids that you can install to ensure the safety of your loved one. From bathtubs to handicap bars and other accessories, you will find that there are many choices available to fit your specific needs. One of the most common bathroom bathing aids are shower benches. The bench is water safe, and allows for easy access of the bathing facilities. A bathing bench that is used along with a hand held shower is perfect for anyone who suffers from lower back issues that prohibit bending, or for anyone with difficulty standing. You may also find that shower grab bars are a good addition to the bath, as well. Grab bars will provide support when moving from the sitting to standing position. The image to the left is for those in wheelchairs. It acts as a tray that goes over the person’s neck. There is an additional spray nozzle that helps wash the person. The tray prevents water from leaking to their bodies. A bath mat is also a very basic handicap bathing aid that you will want to install if you are trying to avoid slipping in the shower or bath. The mat will attach to the bottom of the tub using suction cups, and is a good idea to use in any home. A great handicap bathtub bathing aid that you may want to have on hand is a soap and lotion applicator that is made of a long applicator stick with an attached sponge. You can use the sponge in the bath or shower to clean hard to reach areas, such as the ankles, feet and back. The applicator head is also replaceable, so you will have a clean, fresh sponge as needed. Anyone with limited motion on their shoulders will find the long length of the bathing washer aid very helpful. For people who are restricted to bed, you will find that there a portable shampooing basin is a necessary disabled bathing aid that is used frequently. You simply need to fill the basin with warm water, and place it under the patient’s head. You will easily be able to shampoo hair using this handy basin anywhere in the home. The added height of the double tube design helps to prevent the water from splashing out onto the handicap bed. Since the basin is inflatable, it is also very easy to store. Once you are done, use the attached hose to remove the soapy liquid. This is the perfect handicap bathing aid for caregivers and what you should use for easy bathing in bed. If rinsing off shampoo with water is an issue for the patient, there are no water necessary shampoos that can do the job of washing hair without the use of water. Simply apply to the hair, massage it in and then use a towel to dry off. 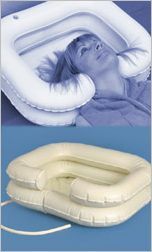 It is also perfect for someone who recently had back surgery and cannot get their back wet.